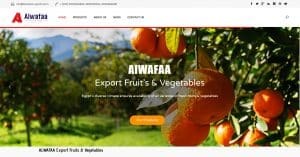 THe WORLD GRAPHIC “GEVA” team recently set up a website for a company exporting fruits and vegetables. We take into account the quality and professional standards in the design of our clients’ websites. We help our clients to have their website as a support for the company’s marketing policy. Therefore, our role is not limited to the design of the website, but we try to make the website of our customers have a positive impact on increasing profits and sales.